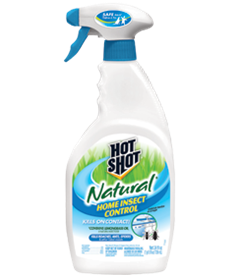 We had an ant invasion over the weekend and got this product on an emergency trip to the store after not being able to find our preferred product. It doesn't last very long- we used the entire bottle in one day without covering the entire area. It also has a VERY strong smell. Two days after we sprayed it you can still smell it as soon as you're halfway down the stairs. We choose this spray because it was safe around children and pets, and didn't look like it would have a "poison" smell. It smells like lemongrass oil, but it is so thick and strong that it makes it hard to breath. On the plus side, two days after we sprayed it we haven't seen any new ants.